It was time to make my annual visit to the dentist, especially since a) I hadn’t been in 18 months, and b) I had a toothache. Anticipating a possible root canal and/or new crown, I decided a trip to Los Algodones was in order. 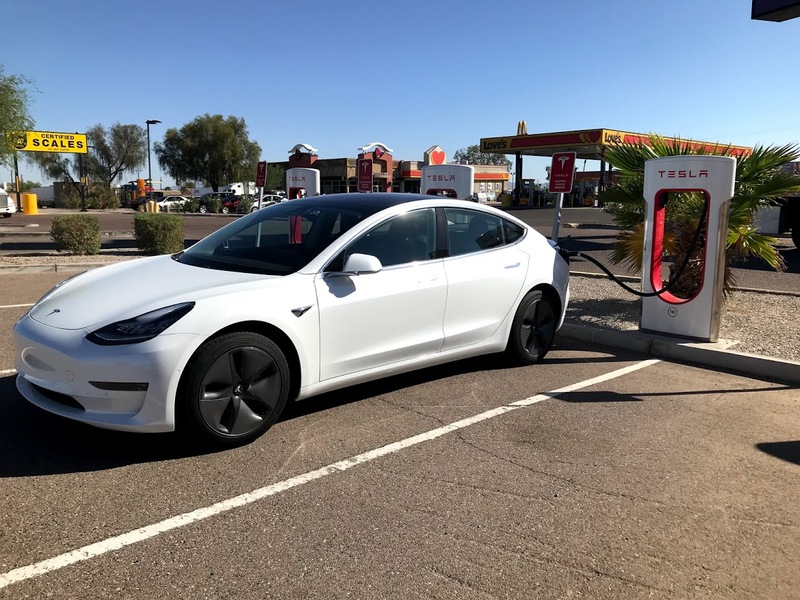 Daryl had driven to Los Algodones several weeks earlier in his Tesla Model 3 so I knew where the Superchargers were and whether there were any amenities nearby. The Gila Bend charger is at a Carl’s Jr, but the Yuma charger is adjacent to a small hotel and city meeting center with no food options at all. 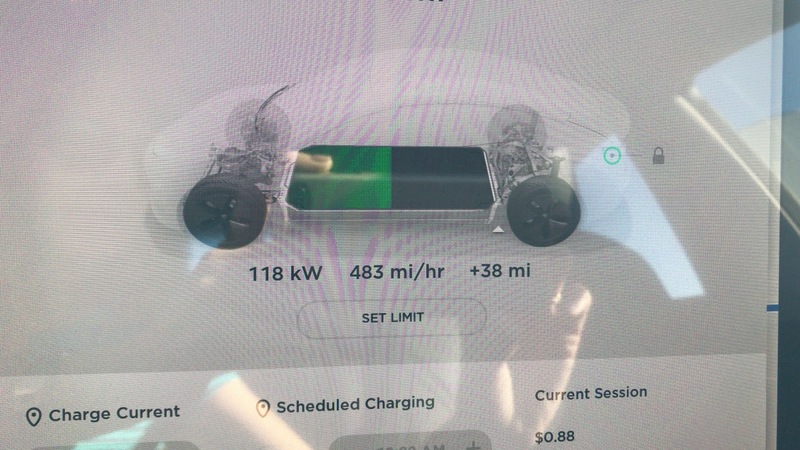 My Tesla Model 3 has enough range to make it from Mesa to Yuma without charging, but since I didn’t relish spending 30-40 minutes sitting in my car or a hotel lobby, I decided to take advantage of the Gila Bend charger and top off on my way through. I have also read on the forums that stopping more often for shorter charge times will result in more range, since charging slows the closer to full the battery gets. So I stopped in Gila Bend and charged while I used the restroom and bought a breakfast sandwich, then got back on the road. Dr. Sonia quickly determined the ache under my crown was not new tooth decay, but inflammation in the gums. The crown has a bit of a gap between it and the next one, creating a lovely spot for food to get trapped. Although I am a dedicated flosser, Dr. Sonia says food has made its way up into the gum line where floss cannot reach, and I needed a deep cleaning in that location, plus a new crown that seated better and filled the gap. I asked how much this would all cost, expecting between $300-600, and she totally surprised me by saying $180 for the crown and $70 for the deep cleaning. Sign me up! She did the workup and impression for the new crown, and I made an appointment for the following week to have the new porcelain beauty installed. 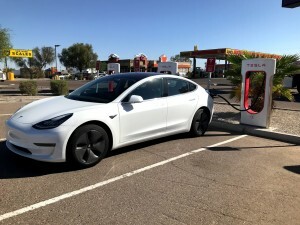 I stopped at the Yuma Supercharger before heading back up I-8. Daryl was right; there was not much nearby to hold one’s attention. I walked over to the hotel to see if there was anything interesting, but not even a gift shop or vending machine was to be found. (Since I was still numb, a vending machine wouldn’t have done me any good anyway.) By the time I returned to my car, I had plenty of charge to make it to Gila Bend. I made another quick stop at the Carl’s Jr and “gassed up”. This time I charged about 10 minutes to get me home with plenty of range left on my car. I’ve used the Traffic Aware Cruise Control (TACC) and Enhanced Auto-Pilot (EAP) around town, but this was my first chance getting out on the highway and really putting it to use. Interstate 8 is a perfect test track because there is much less traffic than I-10. By hanging my hand on the steering wheel, I get enough resistance to satisfy the safety reminder, and also allow the car to handle all the steering. I was listening to a good audiobook, or I might have found myself getting sleepy. I think that’s a possible danger of auto-pilot or self-driving; you fall into a daze and lose focus. I can’t wait for more EAP and self driving features to be unveiled and delivered in future weeks and months that will make this little car even better and safer than it already is. The following week, I made my way back to Dr. Sonia’s to get my new crown put on. Second verse, same as the first. The drive was a dream. I’m looking forward to driving to Boise for the Thanksgiving holidays, and now I feel like I’ve got some experience under my belt that relieves range anxiety. I love my car, and I love my shiny new tooth! Like my experience, I found that the charging stops are not tedious or a waste of time. It generally is a good time to get out and stretch for a few minutes anyway. And almost always there is a restroom and restaurant very nearby. I’m a little worried as more and more Teslas get on the road that when traveling on a holiday there might sometimes be a wait. But so far so good.